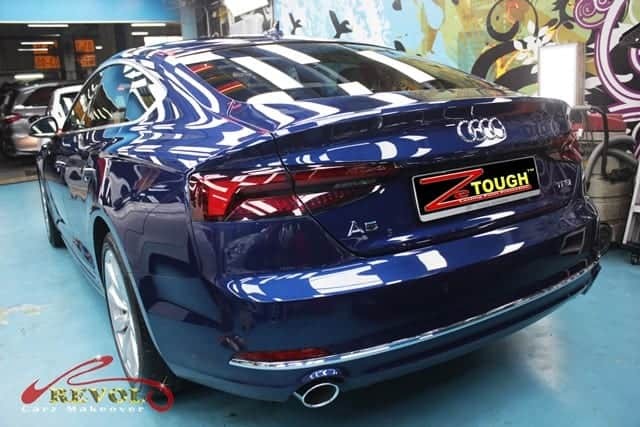 The makeover of Audi A5 Quattro Sport back is brilliantly gleaming, athletic and elegant when complimented with ZeTough Ceramic Paint Protection Coating. With breathtaking, deep luster, the 5-door Coupe is set to turn heads on the road. 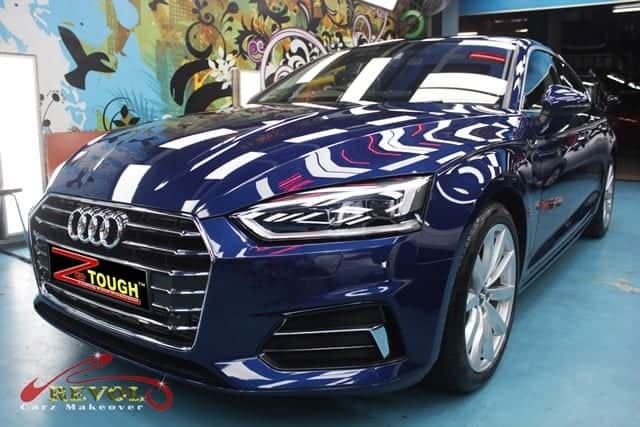 Blending hatchback versatility, sedan spaciousness and coupe styling, the Audi A5 Sport-back exudes a masterpiece with state of art technologies and innovative systems. The new wraparound bonnet design cleverly hides the shut-line in the front fender, while the front single frame grille and headlamps are now more angular than its predecessor, with the grille featuring a wider and flatter design. Just as attractive is the interior redesign. 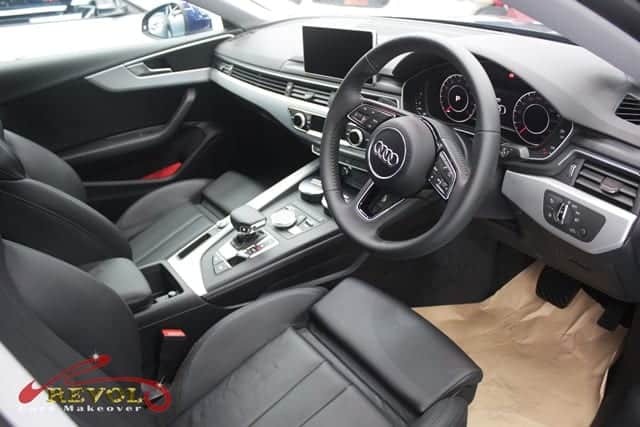 The all-new A5 Sport-back features Audi Virtual Cockpit, a large 12.3-inch TFT displays richly detailed graphics to let you to drive with confidence. Together with the MMI navigation plus including 8.3-inch monitor on the center console, you’ll have a complete and powerful central information unit. Lurking under the hood is a turbocharged 2.0-liter four-cylinder that makes 252 horsepower, 370Nm maximum torque and seven-speed dual-clutch box for robust acceleration. The 0-100km/h sprint comes in an amazing 6 seconds with a top speed of 250km/h. Please join us in the ride through our postings and experience the transformation of the Audi A5 Sport-back to a staggering, better-than-showroom, long lasting shine. 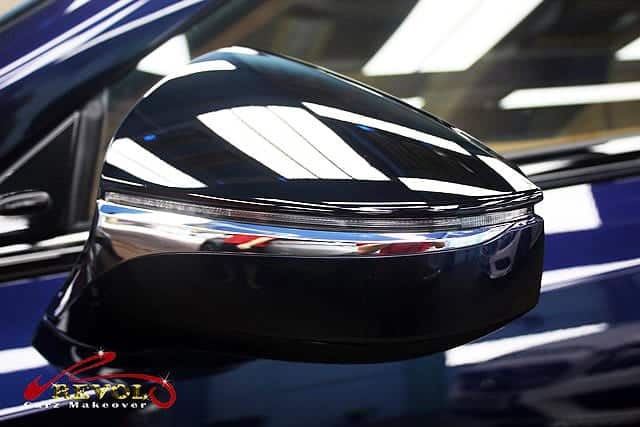 At Revol Carz Makeover, we are inspired to transform every car to a stunning showroom condition and ensuring your exterior paintwork gets the best, long-term protection. The new wraparound bonnet design does a clever job of hiding the shut-line in the front fender. The front single wider frame grille and headlamps are more angular than the predecessors. The headlamps are ultra-clear and shiny after skillful manual polishing by our detailers. 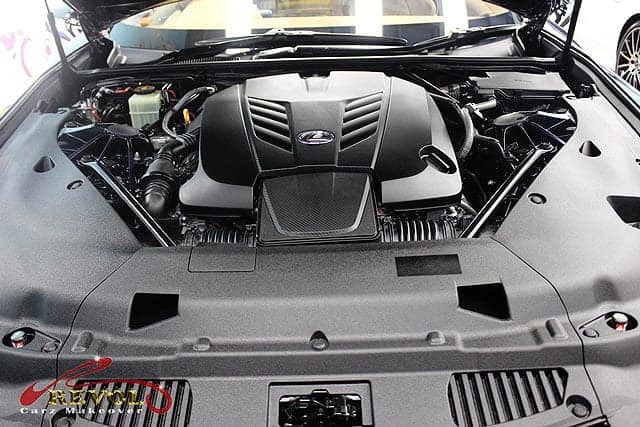 Achieving an engine bay that is as clean and immaculate as this gives us a sense of pride. Our uncompromising detailers take meticulous steps to clean the elegant Audi’s virtual cockpit. 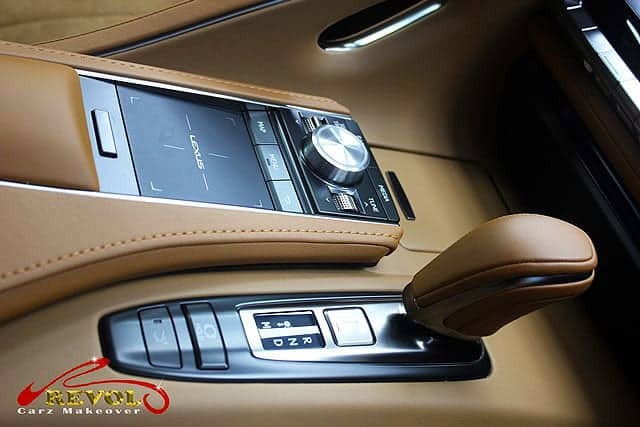 All leather surfaces are sanitized, polished and treated for long-term protection. Audi’s combination of click-wheel controller, physical buttons, touchpad, and steering-wheel controls is nicely realized. 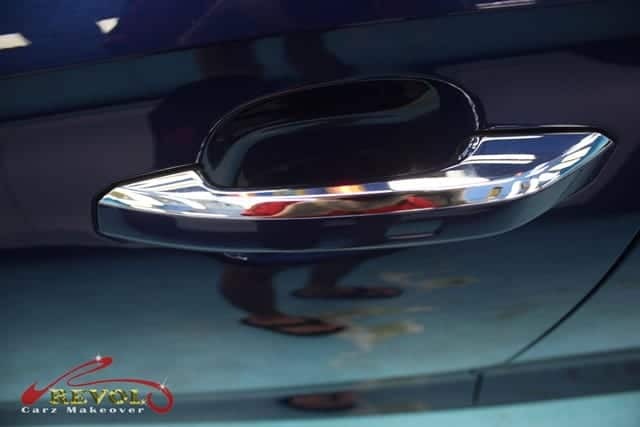 The distinctive aerodynamically shaped exterior mirrors sit on the door sills and boast of the deep shine created with ZeTough Ceramic Paint Protection Coating. Perturbed by unsightly finger-nail scratches around the door handles? With ZeTough’s glass-like hard, gloss coat, the paint surface gets long-term protection. The rear is just as stunning after the Revol’s makeover with treatment of ZeTough Ceramic Paint Protection Coating. The Audi A5 Sport-back offers a wide and deep boot space with 480-litres of luggage capacity. 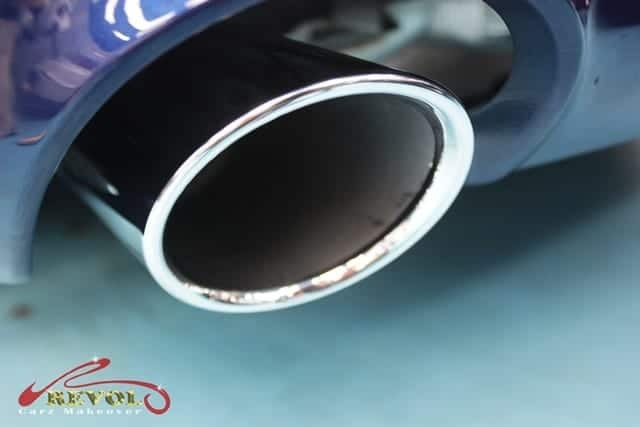 The exhaust tail pipes are cleaned and polished like brand new for the finishing touch. The Audi A5 rolls on fully restored and polished 18-inch wheels with 40-series tires. Nothing gives us more inspiration than putting a smile on our satisfied customers’ faces when after the incredible makeover. Thanks to the wonders of ZeTough Ceramic Paint Protection Coating. After Revol’s professional makeover, the Audi A5 Sport-back boasts of a brighter shine in showroom condition. ZeTough’s incredibly long lasting protective luster promises to give the paintwork a lifetime protection. If the stunning outcome of the makeover impressed you, give your car a treat with the reliable, long lasting surface protection too. You can count on our award-winning and proven, ZeTough Ceramic Paint Protection Coating. Yes, imagine what we can do for your car in the makeover. 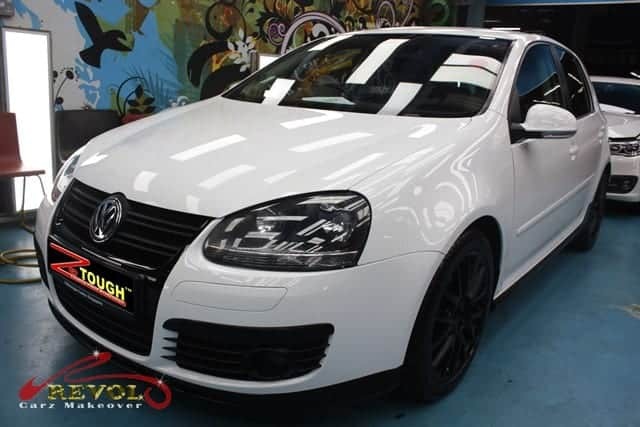 VOLKSWAGEN GOLF GT 1.4 TSI Full Car Spray Painting with ZeTough Ceramic Paint Protection Coating. Giving your car a new coat of paint is more than just about vanity. It not only helps to protect your car’s surface but making it looks good for longer and adds to your car’s value. 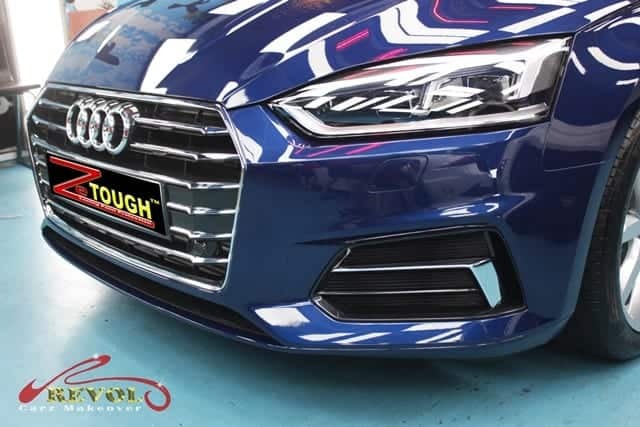 It makes prudent sense to give the surface another layer of protection with ZeTough Ceramic Paint Protection Coating to extend the life-span of your car and better withstand the weather and the elements stresses. 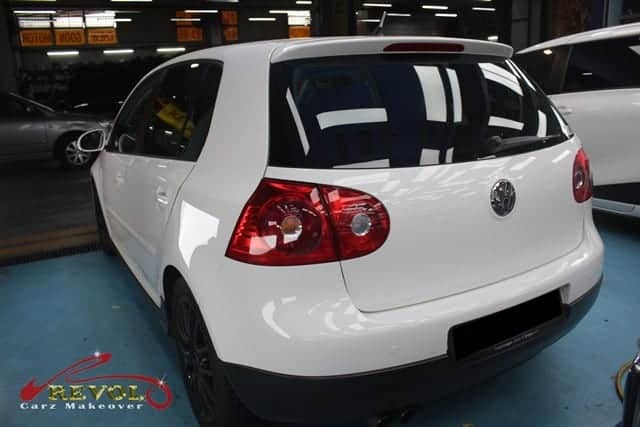 We were privileged to transform the Volkswagen Golf GT with a new coat of paint at Revol Carz Makeover workshop and also gave additional protection with the award-winning ZeTough Ceramic Paint Protection Coating. The Golf GT 1.4 TSI’s efficient 1.4-liter twin-turbocharged petrol engine impresses with a muscled 250Nm of torque and 170bhp of maximum power. A top speed of 218km/h is complemented by 8.4 seconds Century-Sprint time. Preparation for a professional paint-job essentially requires many parts to be dismantled, such as the doors, seals, bonnet, trunk and bumpers. To allow the new coat of paint to reach tight and hidden recesses, the headlights and tail-lamps need to be removed. Alas we transformed the hot hatch Volkswagen GT into a stunning better-than-the-showroom gem with a new coat of premium paint and finishing off with the most advanced ZeTough Ceramic Paint Protection Coating. The headlamps were patiently polished manually to achieve the stunning crystal clear finish. 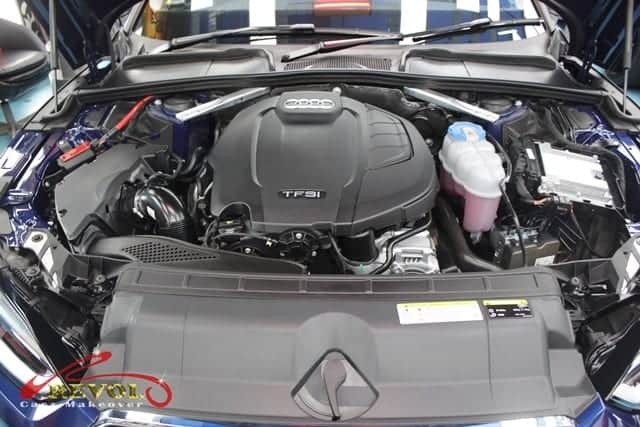 Presenting an impressive super-clean twin-turbocharged engine bay is an exhilarating challenge and pride for our detailers. 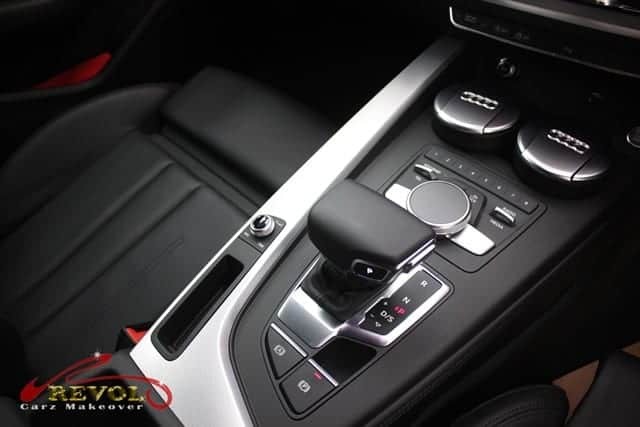 Revol’s detailer takes meticulous steps to produce a show-quality super-clean interior. Deodorizing, shampooing, vacuuming and conditioning the upholstery to look and feel nice. 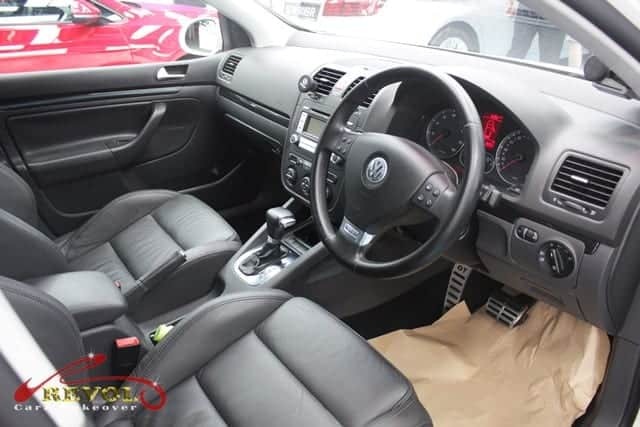 The Golf GT gets an impressive number of features and equipment such as, a multi-function trip computer with 3.5in display, start/stop function, adaptive cruise control and a 5.8in color touch-screen centre console. 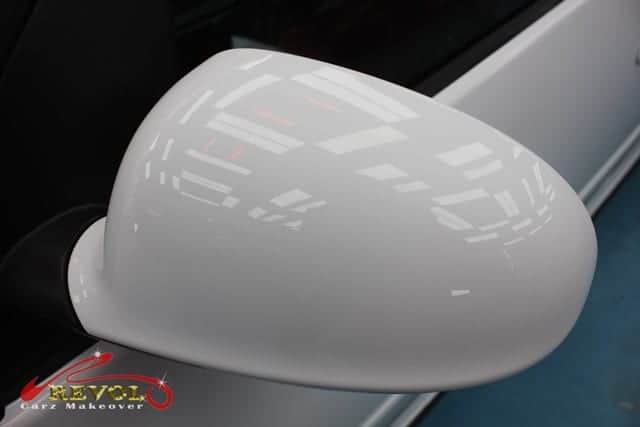 The wing mirrors, condition before ZeTough Ceramic Paint Protection Coating. See the difference after the ZeTough Ceramic Paint Protection Coating is fully cured? 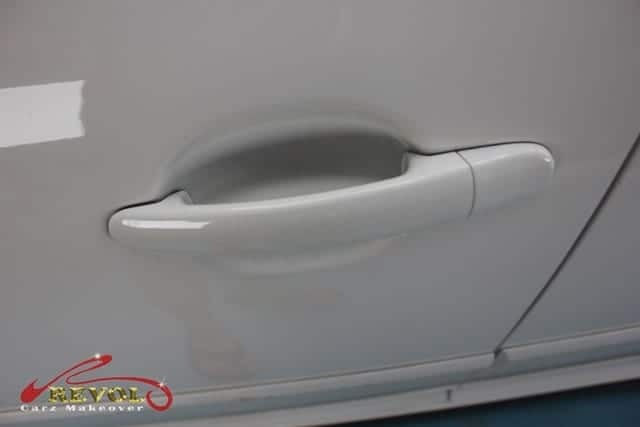 Nobody likes to see finger-nail scratches around his car’s door handles. With the 9H pencil hardness of the clear glass-like shield, ZeTough Ceramic Paint Protection Coating ensures that finger nails scratches are things of the past. 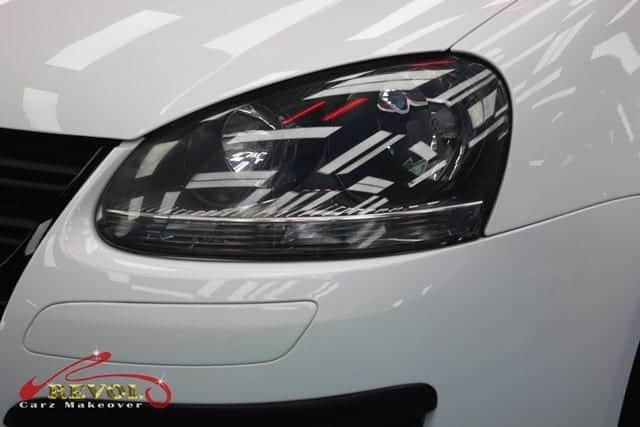 From any angle you gaze at the VW Golf GT, it is easy to see that it has been treated with the award-winning ZeTough Ceramic Paint Protection Coating. 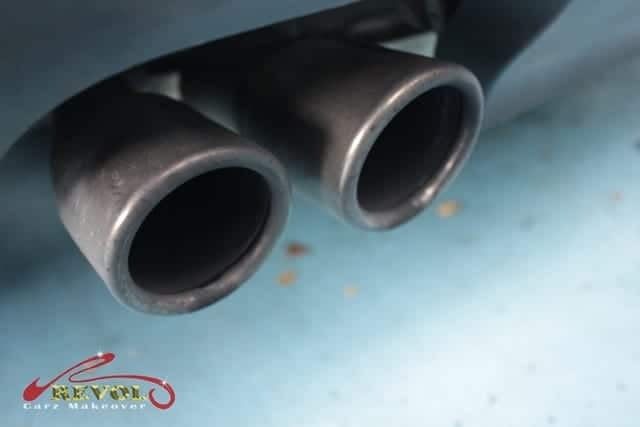 The twin-exhaust pipes covered with soot before cleaning and polishing. 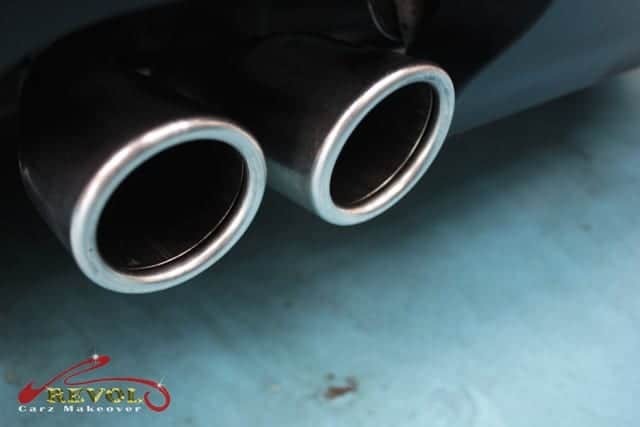 The twin-exhaust pipes look as great as new after manual cleaning and polishing. 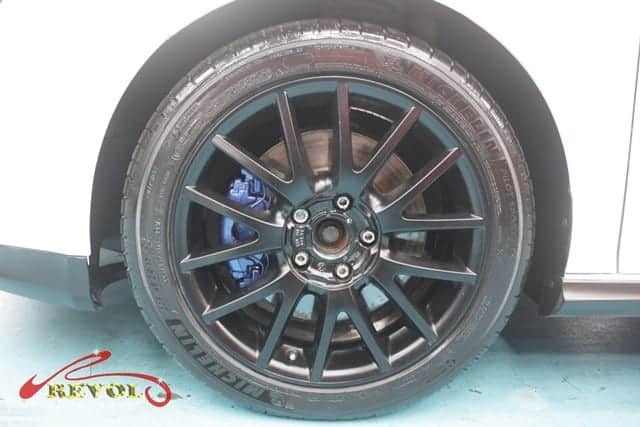 The stylish 17-inch alloy wheels in new showroom condition after restoration. Nothing gives us more inspiration than putting a smile on your face after the impressive makeover. Thanks to the incredible performance of ZeTough Ceramic Paint Protection Coating for the extraordinary achievement. 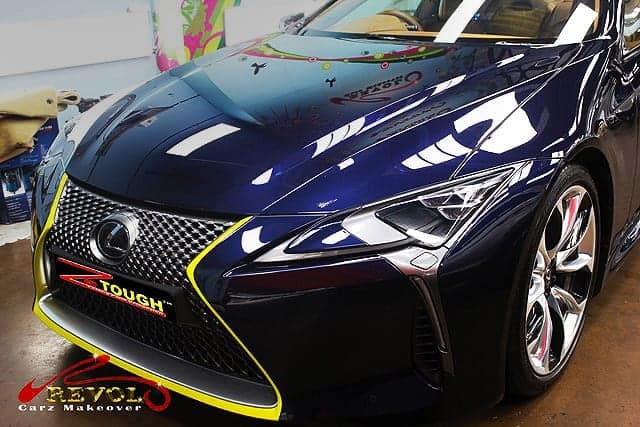 A provocative Lexus LC500 Coupe’s tumultuous arrival at Revol Carz Makeover stirred up the air with excitement, sending our detailers darting enthusiastically to groom the car with the lauded, ZeTough Ceramic Paint Protection coating. The 2018 LC500 is probably the most extroverted and gorgeous Lexus you have ever seen. The show-stopping, ultra-low center-of-gravity body strikes a sleek and seductive silhouette. The front façade features newly developed ultra-compact LED headlamps, arrow-head daytime running lights and a dynamic new spindle grille. 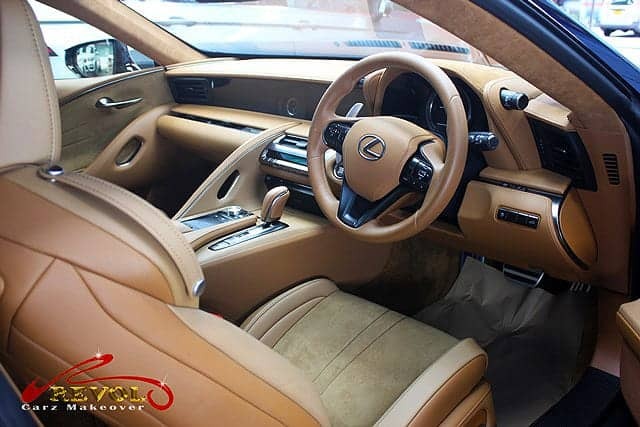 Standards on the LC500 include carbon-fiber detailing, a sleek carbon roof, leather-trimmed steering wheel, magnesium shift paddles, aluminum foot pedals, a hand-stitched leather-wrapped gearshift lever, bezel-less door handles, and Alcantara door panel trims. Note-worthy aerodynamic features the zero stabilizing, an active rear wing and the world’s first rear aero ducts. The Lexus LC500 is powered by a robust 5.0-liter naturally aspirated V8 engine mating a 10-speed automatic transmission and producing 470 brake horsepower and 530Nm of torque capable of a raucous acceleration from 0-100km/h in 4.7 seconds and a phenomenal top speed 270km/h. We are inspired to post the following evocative images of the gleaming, Lexus LC500 in unique Structural Blue. Hop in and be blown away by the awe-inspiring Revol makeover transformation with a touch of ZeTough Ceramic Paint Protection Coating. The new Lexus LC500 in the unique Structural Blue body color. With the ZeTough Ceramic Paint Protection Coating, the LC500 strikes a sleek and more seductive silhouette and adds a spectacular, longer-lasting exterior luster. With ultra-compact LED headlamps, arrowhead daytime running lights, a dynamic new spindle grille and the spectacular deep ZeTough shine on the sharp front façade lend boldness to the LC500. The Ultra-compact LED headlamps are crystal clear after passionate manual polishing. Our skilful detailers make an elegant impression with an amazingly super clean engine bay of the LC500. Hours of meticulous detailing to achieve a superb standard of refreshed and spotless interior is the pride of our detailers. All leathers are sanitized, cleaned, polished and nourished with eco-friendly leather-care products for a longer lasting protection. A close-up and in-depth look at the alluring console featuring soft, cleaned leather after refined cleaning and treatment. The beautiful leather shift knob is another example of our dedication to fine details. 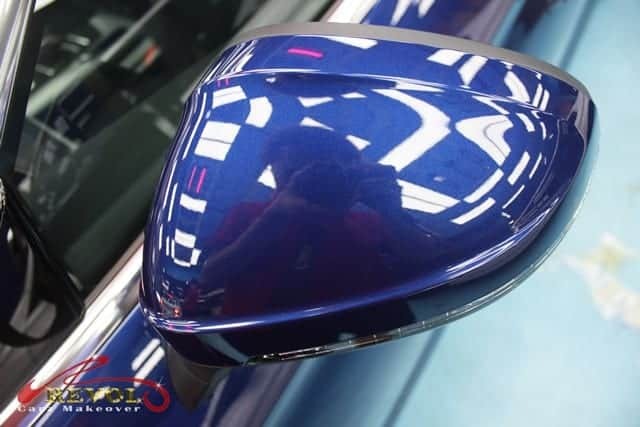 The next-generation “Blind-spot Monitor” wing mirror is brought closer to greet you with the fascinating deep shine made possible with ZeTough Ceramic Paint Protection Coating. Know when vehicles are approaching from behind even at higher speeds with the Blind Spot Wing Mirrors. 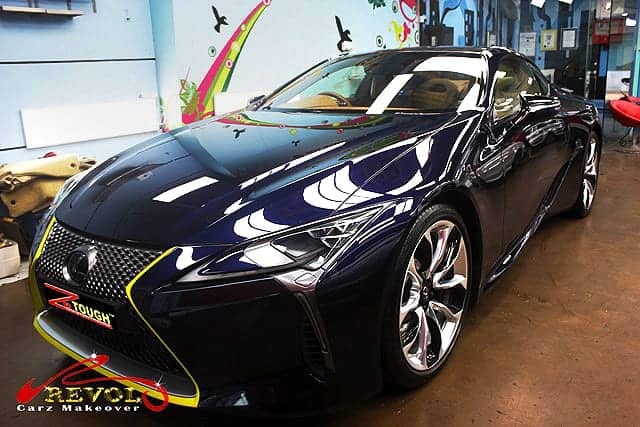 Gaze at the Lexus LC500 at any perspective and you’ll be fascinating by the phenomenal long-lasting deep luster created with ZeTough Ceramic Paint Protection Coating. The rear features a Retractable Active Rear Wing Spoiler, elegant signature L-shaped tail lamps and the world’s first rear aero ducts. 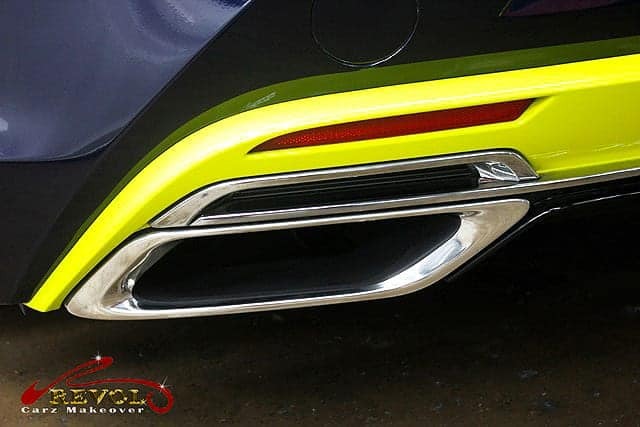 The unique design twin tailpipes are manually polished for the showroom looks. 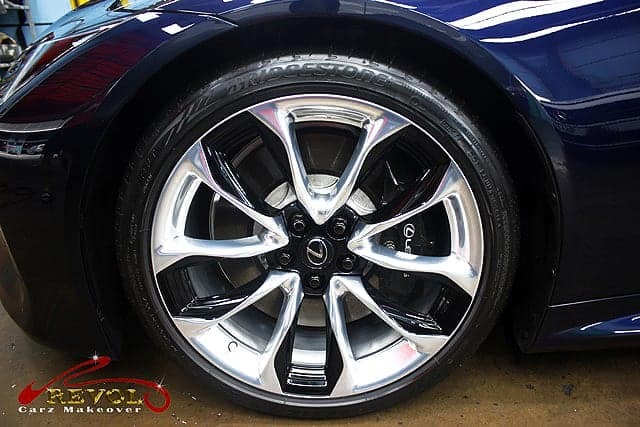 The LC500 gets the standard Forged Alloy Wheels with Run-flat tires. For the finale, we dismantled all the wheels for cleaning, polishing and restoration for the grand, exceeding-the-showroom look. Nothing gives us more motivation than earning smiles on our satisfied customers’ faces after the extraordinary makeover. Thanks to the proven properties in ZeTough Ceramic Paint Protection Coating. After the Revol’s professional makeover, the Lexus LC500 brags of a deeper glass-like gloss in better-than-showroom condition. ZeTough’s incredibly long lasting protective 9H pencil hardness ceramic film promises to give the paintwork a lifetime protection. If the stunning outcome of the makeover impressed you, why not give your car a treat with the reliable, long lasting surface protection too? You can count on our award-winning and proven, ZeTough Ceramic Paint Protection Coating. Yes, imagine what we can do for your car in the makeover.